Our serviced apartments are providing the smarter choice between home and motel for business or leisure travellers. When you stay in an Emerald Executive Serviced Apartment you get much more than a motel room. For around the same rate you pay for a motel room or other accommodation Emerald, you can have your own furnished apartment with a balcony & kitchenette. An Emerald Executive Apartment is your ideal accommodation solution... prime location, space, comfort and security. You deserve great value with sophisticated apartments. Our accommodation in Emerald QLD will not disappoint. While you'll no doubt want somewhere to stay that's both comfortable and well equipped, you probably won't want to blow your whole budget on accommodation, especially when there are so many other things on which to spend your hard earned money. And that's where Emerald Executive Apartments can help, as we offer some of the best-appointed apartment and motel accommodation in Emerald at a very affordable price. Known as the gateway to the Sapphire Gemfields, Emerald originally expanded to accommodate the railway workers as they toiled to connect the country by rail. Named after a verdant emerald green hill located just to the north of the town, it attracts many visitors, both for business and for leisure, especially around the areas of Fairbairn Dam and Lake Maraboon. Both of these places are a popular choice for holidaymakers looking to get back to nature, to fish in the cool waters, enjoy outdoor barbecues and picnics, and generally just relax and have fun. If you'd like to experience nature with all the home comforts, a stay at our luxury serviced apartments in Emerald is just what the doctor ordered. Our sophisticated serviced apartments have been designed to appeal to visitors of all types, particularly as our accommodation gives you much more bang for your buck than you'd get from your average motel room. You'll get your own furnished apartment with both a balcony and a kitchenette, making it the perfect place to prepare a light meal and relax after a hard day's business or sightseeing. Located on Egerton Street, at the corner of Max Gorlick Drive and Egerton Street itself, our stylish apartments offer well-priced accommodation in Emerald for both business travellers and holidaymakers. They're just 50 metres away from coffee shops and the Market Plaza Shopping Centre, and a little under 200 metres away from a number of restaurants. What's more is we're merely a stone's throw away from Emerald's Botanical Gardens, and our apartments are literally a short walk away from Emerald's Golf Club. 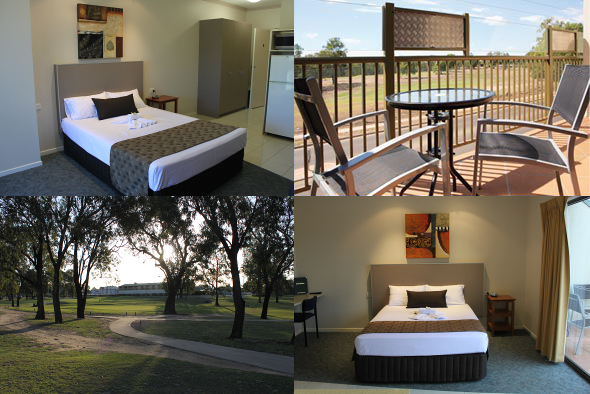 So, if you're looking to get away for a golfing weekend, our accommodation is the perfect place to stay. And, if golf's not your thing, you can simply enjoy the views across the golf course from the privacy of the balcony attached to your apartment. In addition, don't forget to look us up if you're planning a trip into town to attend the annual Gemfest, or if you've coming to Emerald for the Agro field day; these are both really busy times of the year in Emerald, so it's wise to get your booking in as early as you can, to ensure that you get the apartment you want. All our modern and stylish apartments are fully self contained, comfortably furnished and include keyless entry, LCD televisions, free Foxtel and free Wi-Fi internet access, and are kept cool via means of reverse cycle air conditioning. What's more, each and every apartment has its own private balcony with a view of the golf course, which is the perfect place to relax with a glass of wine or beer as the sun goes down. And to make sure that your holiday really is a time to unwind and get away from it all, all our apartments are serviced on request by our friendly and efficient staff. With all that said, we'd go as far as to say that our executive apartments are some of the best accommodation Emerald has available, and with Queen Suites starting at just $99 per night and twin suites (which sleeps 3) also at $99 per night, you can see that you're really getting value for your money.